Did you take part in this year’s record-breaking Veganuary? Congrats if you were one of the 250,000 people that did just that – you guys ROCK! To those who simply embrace it as annual challenge then go back to your usual way of eating – you’re making a bigger difference than you realise. To the ones who turn vegetarian after doing it as you found being full-on vegan a bit too tricky – you’re doing great! And to the ones who have breezed through Veganuary and decided to stick with the vegan gang (like my amazing mother-in-law) – welcome! You have joined a movement that has compassion at its heart and recognise that animals are simply not ours. Generally speaking, vegans choose to avoid all animal products in every form, as much as they possibly can. 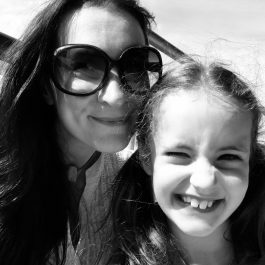 Mistakes sometimes happen – no-one is perfect! Veganism isn’t about perfection, it’s about doing your very best to cause as little suffering and environmental damage as possible. If you accidentally slip up, dust yourself off and get right back on the vegan wagon. There’s room for everyone here. What Do Vegans Eat Though? Most things, frankly. Chances are, you’ve heard this question many times already. In addition to the blindingly obvious vegetables and fruits – which should play a big part of your diet anyway – you very quickly realise that so many items you were already eating are, in fact, vegan! Thousands of everyday products are ‘accidentally vegan’ – they are neither made for, nor marketed at, vegans. They just are – and always were – vegan. Pasta, rice, bread, plus plenty of crisps and snacks – there’s a good chance it’s vegan. As well as protein-rich nuts and legumes, there are also meat-substitutes aplenty; vegans can even get bleeding burgers now, if that’s your bag. It goes without saying you’re always better off cooking your own meals from scratch, but if you fancy it, you can pick up vegan junk food in any supermarket nowadays. Even mainstream pizza parlours have started offering clearly-labelled vegan options! Every food company with an ounce of sense recognises that the future is looking very vegan. What about “May Contain Traces Of…”? But wait! It says “…may contain traces of milk or eggs”. Unless you actually have an actual allergy to these items, ignore it. Companies are required by law to disclose that the item is made in the same factory which handles the allergens, and as such there is a very, very tiny chance of cross-contamination. It does not mean that milk or eggs were used to make the product, and by purchasing the item you are sending a clear message to the company that you support products that contain no ingredients derived from animals. Yes. Yes you can. There are a few accidentally-vegan crunchy chocolate chip cookies to be found in the supermarkets, but these are the ones you really want. 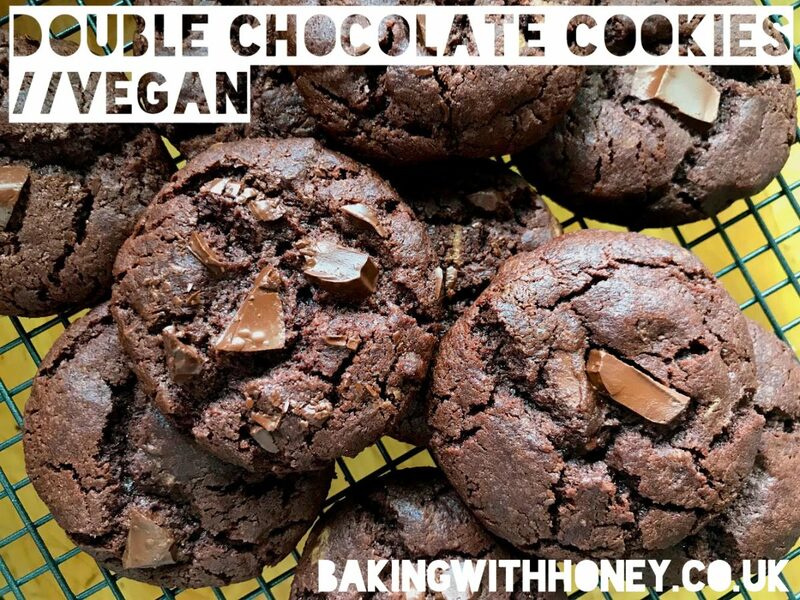 This recipe – which is adapted from my own Perfect Vegan Chocolate Chip Cookies recipe – makes deliciously soft-baked, double chocolate cookies. Like the ones you know and love and thought you’d never be able to enjoy again! You’ll never have to offer these to your friends with an apologetic smile – because no-one would think they were any different to your regular chocolate chip cookie. Also they’re so good you probably wouldn’t want to share them with your friends anyway. Just kidding. (Sort of). With no weird egg substitutes involved – this is all stuff you’ve probably already got in your cupboard – you can rustle up a batch of these whenever you fancy. Give them a whirl and let me know what you think! Makes 10 very large cookies or 20 smaller ones. Preheat the oven to 190c/375f/gas mark 5 and get your baking sheet ready (line it if you’re not sure of its non-stick properties). 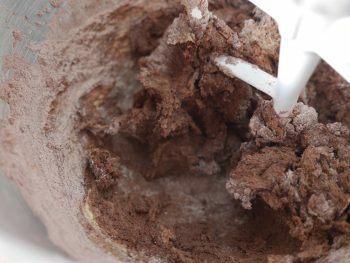 Break up the bar of chocolate into a microwavable jug or bowl and melt in 20 second bursts (700w microwave), stirring each time. Set aside for a moment. 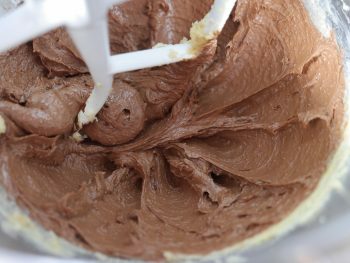 Measure the butter, two sugars, milk and vanilla into a mixing bowl and beat until creamy. I use a stand mixer for this. Switch the motor off and pour in all the melted chocolate. Beat again just until the chocolate is evenly incorporated. 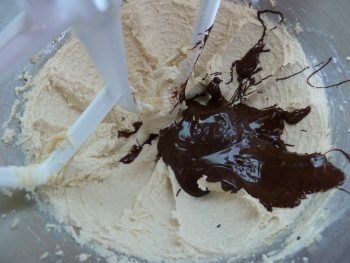 In a separate bowl, stir together the flour, cocoa powder, baking powder, bicarb and salt. 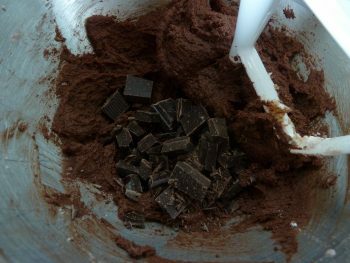 With the mixer running on the lowest speed, add the flour mixture one heaped tablespoon at a time until you have a cookie dough. Do not over mix! Sprinkle in the chocolate chips or chunks and beat for a final couple of seconds. 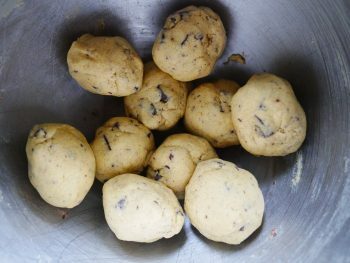 Using a spoon or a 50ml ice-cream scoop, form 10 equally sized cookie balls. 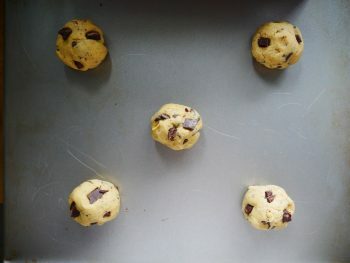 If you want 20 smaller cookies, I find it’s easier to form 10 cookies then simply halve them, then roll them into balls. Place onto a large baking sheet (5 big cookies or 10 smaller ones at a time – keep the rest in the fridge while they await their moment of glory in the oven) and bake in the centre of the oven for 10 minutes. They will look very soft – they will firm up as they cool, so don’t be tempted to over bake! After about 5 minutes, slide a palette knife under the cookies and transfer gently to a cooling rack – then you can reuse the tray for the next batch. 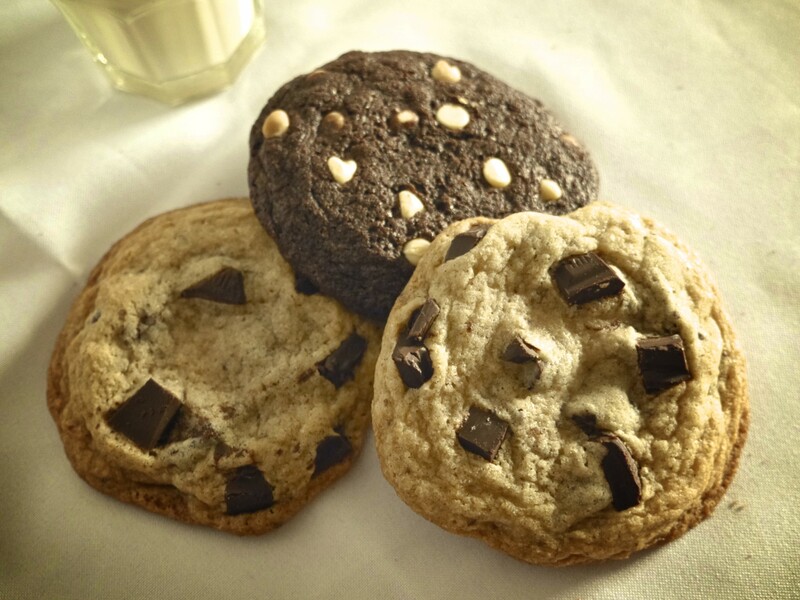 Sprinkle the still-warm cookies with a little crushed sea salt flakes if you like for extra deliciousness!